Continue to follow Barossa Valley Way/B19. Turn left onto Railway Tce and 290 Angaston Road is 3km on the right side of the road. Affordable Barossa Valley Bed and Breakfast accommodation. 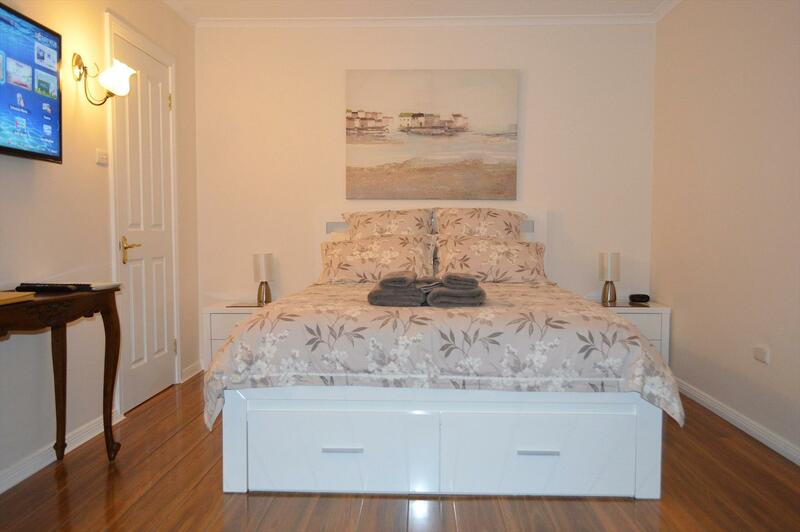 Self Contained Cottage with 1 Queensize Bed, amongst the Barossa Valley vineyards. Enter via private gravel driveway. Clean and elegant, no fuss accommodation with basic amenities. The Cottage is just behind your hosts' main residence if you need anything. Complementary bottle of wine when booking for 3 or more nights. Now accepting one night bookings for $195 to cover extra cost of cleaning etc. Located centrally between Nuriootpa and Angaston, Almond Tree Cottage neighbours local vineyards with easy access to the Barossa Bike and Walking track, the renowned Farmers Market and local wineries. Almond Tree Cottage features exclusive use for one or two guests. Strictly two people maximum. Room One: One bedroom with Queen size deluxe bed, quality linen and electric blanket. Smart television and comfy chairs. The cottage has reverse cycle air conditioning and an overhead fan. Room Two: Kitchen with table and chairs for two, refrigerator, electric stove, cooking utensils, wine rack, chopping board, microwave oven. Pantry items. Room Three: Bathroom with heated towel warmer and shower. Towels are supplied. Generous breakfast provisions include tea, coffee, milk, butter, eggs, bread, cereals, jams, spring water, vegemite and pantry supplies. There is a small barbecue on the veranda - please ask for gas bottle. Now accepting one night bookings at $195. 1 Queen Size Bed, Smart TV and storage. 1 complimentary wine if booked for 3 or more days. Separate Dining/Kitchen with microwave and stove.